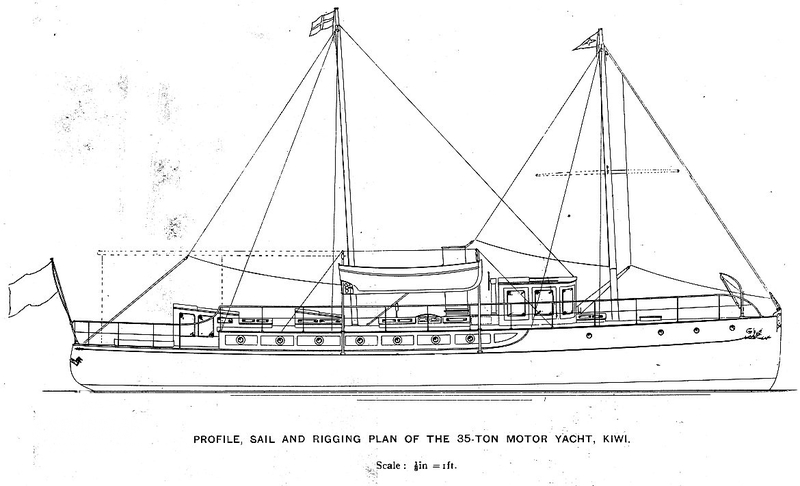 From the board of Herbert White and the Southampton yard White Brothers, despite her name - in recognition of her Kauri pine construction - KIWI was launched as a thoroughly English gentleman’s yacht: one of considerable style, but of manageable size. Her previous owner spent more than 20 years restoring and fitting her out to a very high standard. 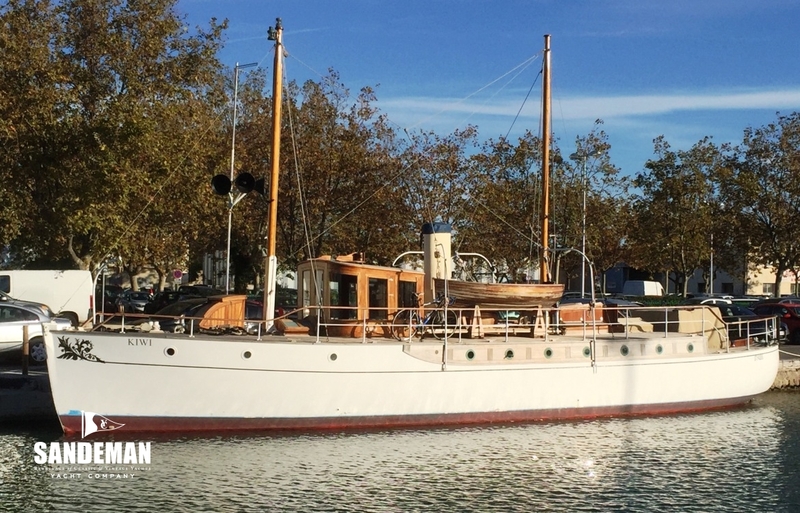 KIWI presents a rare opportunity to own a gorgeously authentic yet highly practical vintage motor yacht with unmistakable looks. 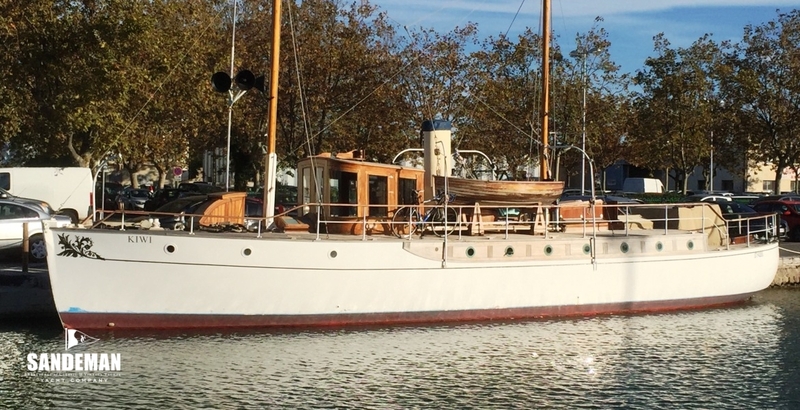 KIWI was designed with quite some flair by Hebert W White and built at his family’s Itchen River yard, Southampton - later the design and build birthplace of the famous “big Class racing cutter LULWORTH (ex TERPSICHORE). 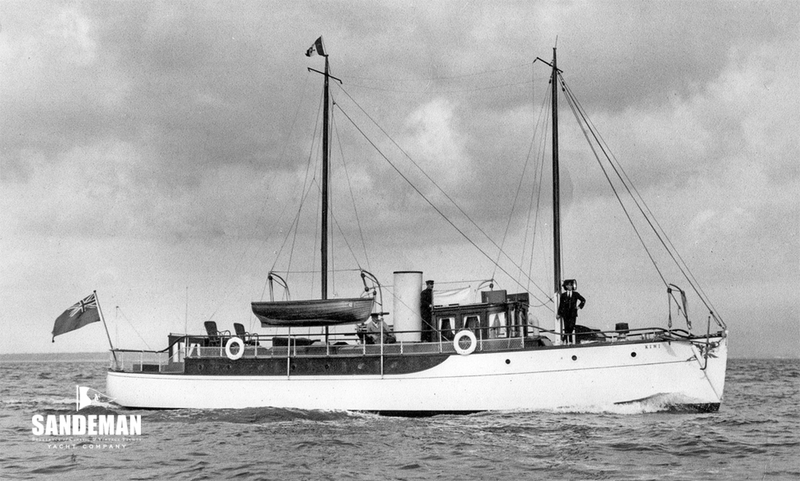 Her commissioning owner, Bromley, Kent-based commercial printer/ stationer and Royal Motor Yacht Club member Henry Griffith had some very specific requirements for his comforts and planned use, including a bath and the means of filling it with warm fresh water, long range fuel capacity, lowering masts for inland waterways, and bilge keels to allow her to dry out handily. 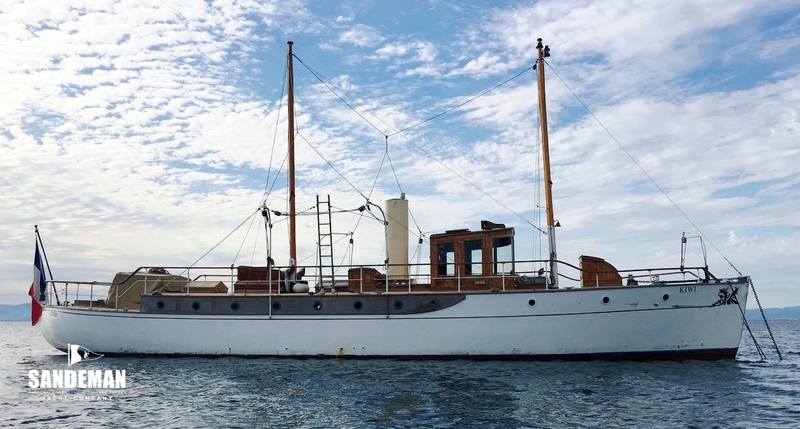 KIWI’s original 60hp, 4-cylinder Parsons paraffin motor clipped her along at 9 knots under trials - more than the contract guarantee - yet in the right conditions she could, and still does, happily cruise under sail alone. Griffith got only a season’s pleasure vessel use of her before first world war requisitioning by the British Government. But the story goes that she remained in the family, with Griffith’s son, Geoffrey, acting as 1st Officer. Between the two world wars, KIWI passed through the ownership of a number of gentlemen of means, including: Henry St. John Winkworth, whose west end London real estate agency still trades in fine property; Randal Vogan, best remembered locally nowadays as donor of Reigate’s much loved Priory Park and who re-engined her with a larger 6 cylinder Parsons; Birmingham brewing baronet Sir Henry Charles Holder; and Manchester architect Captain Vivian D. Pendleton who added a second 6 cylinder 'wing' engine, later removed. KIWI’s second world war requisitioned duty resulted in her being stripped of all her original deck furniture, replaced by an admiralty pattern wheel house. Her war service - some involving salvage work - may have been on the west coast of Scotland as this is where she spent post-war years under the ownership through the late 1940s and 1950s of John Hamilton of Glasgow and Bearsden, followed by Clydeside ship broker and still remembered marine artist, Arthur H Turner. After 1960 the trail runs cold until rescue in the early 1990s from inland waters near Northwich in the north west of England followed by a long period of restoration to the manor born. 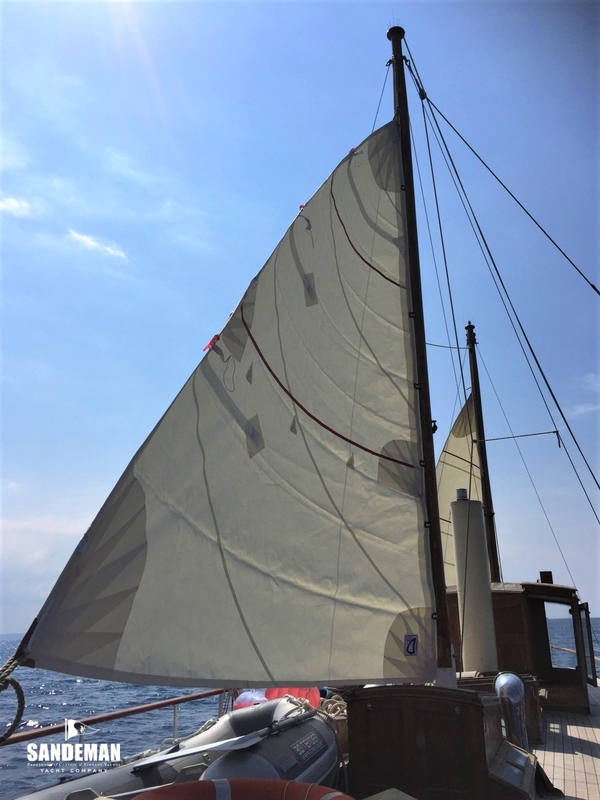 In recent seasons her present owner has cruised KIWI in Mediterranean waters. By the time a yacht reaches 100 years old it will have many tales to tell, and for sure many of KIWI’s are still to be uncovered. Wonderfully, she is still doing what she was commissioned and designed to do over a century after her birth, and is a pleasure to own and behold. 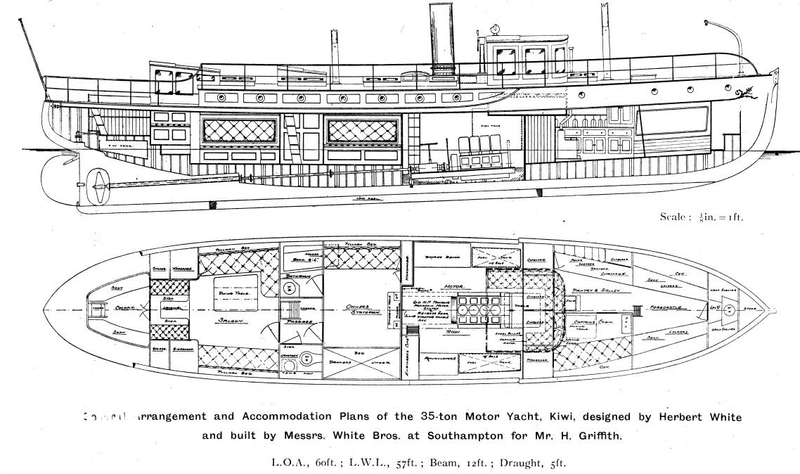 The accommodation below decks is in two cabin areas: a twin cabin forward accessible from the fore deck booby hatch, and the main cabin accessible from the cockpit aft and a deck companionway; the two areas separated by the large full height engine room more or less amidships. The boiler works on 230 V supplied by shore power, generator or inverter. It is controlled by a fully automatic and programmable electronic thermostat located in the saloon. The temperature is adjustable by increments of 0.2 °C. The domestic hot water mode is a priority on the central heating mode, so when asking for domestic hot water, the boiler switches immediately to domestic hot water mode so that hot water is immediately supplied. The 4 water radiators have been oversized (total power 7500 W) to quickly warm the boat during winter (warming the boat from 5 to 22 °C takes only 30 minutes). The central heating by means of water radiators is totally noiseless and is a must in comfort. during 24 hours all 12 V amenities (through the converter), all 230 V amenities (through the inverter) and all 24 V amenities (except the washing machine which can only be used when the generator runs).